NRA Basic Pistol w/ Maryland HQL Sat April 13, 2019 at 9 AM - Hendershot’s Sporting Goods, Inc. Learn in detail how to safely and responsibly handle and shoot a handgun. Discussion of Maryland Law – this portion of the class will exceed the requirements for Maryland’s HQL. Even if you are not a Maryland resident,students in neighboring states will benefit from a knowledge of Maryland law. Class tuition includes everything you need: instruction, gun rental, ammunition, target, and eye/ear protection. 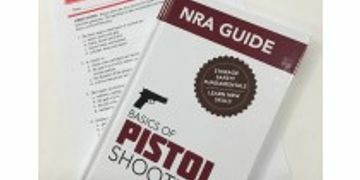 Each student will receive a copy of NRA’s Basics of Pistol Shooting guide. This class is a prerequisite for the NRA Pistol Instructor Class.